Make some fun with your business attire. 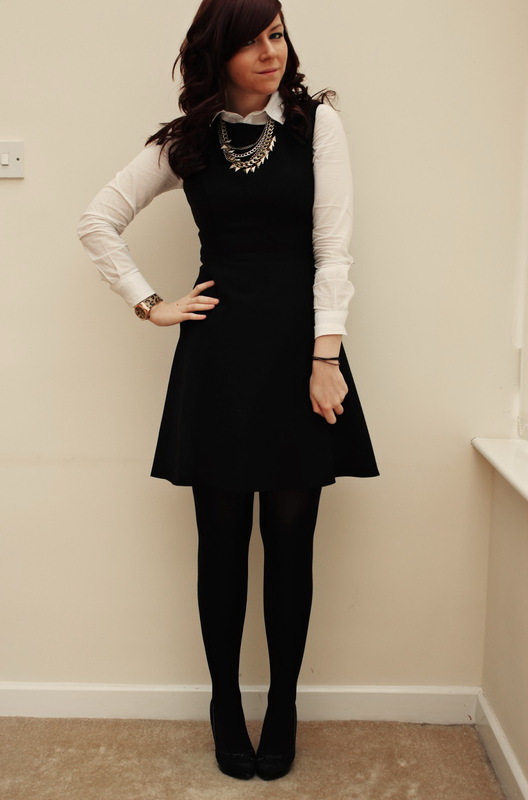 In today's post I want to share awesome ideas on what to wear with work dresses. I think everyone who is reading this right now is either studying or works in a bank, big company or in the office. It's obvious, everyone wants to look feminine anywhere and any time, especially at work, where we spend a half of our day. We see grey colored pencil style version with shirt collar and patch pockets. The dress is belted at the waist. Finish the look by adding a lightweight, shortened cardigan and beige tote bag. The dress is something essential that is ideal for your working hours and after work parties, so choose the one that is most practical and versatile for making a sophisticated look. There are so many styles to choose from, starting from midis to tea-length designs. Better not to show your legs too much. Speaking of silhouettes and designs, then I advice you to choose the one in which you feel yourself comfortable. It can be either monochromatic, either sweetly printed (do not go for too much brightened designs). If you want to emphasize your waist, then it's better to choose the one with a skinny or wide belt. There is kind of uniform or schoolgirl inspired touch in this look. We see a black dress (half leather, half knitted) worn with white shirt, classic heels and rounded shades. The simple LBD looks ideal with statement neckpiece and pale pink pumps. The khaki green jacket looks fantastic worn atop graphic geometric print ensemble. How about this dark blue frock worn with light burgundy leather duffle-bag and chic classic heels. That's an office friendly look that consists of a beige long blazer strapless bandeau dark blue dress and grey beige sandals. Sleeveless shirtdress in khaki green color looks awesome with these eye-catching accessories and jewelleries. Light beige shirt looks fantastic with burgundy long-sleeve dress. Love the way it's styled with grey-beige tote and the same color shoes. Those of you who like smart-casual styles, then I recommend to try on this denim jacket and checkered tea-length shirtdress. Love the whtie, perforated tote bag. The striped black and white fit-and-flare frock looks awesome with skinny black belt, doctor bag and classic flat pumps. Zig-zag print knitted dress looks pretty cool with dark blue blazer. Another black and white colors combination. Love it!